US Republican Senator Ted Cruz has filed a bill to the Senate calling on US State Department to designate Muslim Brotherhood as a terrorist organization. Cruz presented the Muslim Brotherhood draft resolution in cooperation with Senator Mario Diaz-Balart from Florida who filed a similar one to the House of Representative. Cruz – known for his Islamophobia discourse – announced his bill on Twitter, accompanied with the words: “I’m proud”. Cruz’s bill stated that the conditions exist for including the Muslim Brotherhood on the list of foreign terrorist organizations by the US State Department, calling for the disclosure of reasons for the public opinion in case this bill did not materialize. The House Judiciary Committee approved legislation submitted by Cruz at the end of 2015 calling on the State Department to designate the Muslim Brotherhood as a terrorist organization but the bill was not put to the General Assembly. Ted Cruz was one of US President-elect Donald Trump’s Republican competitors in the primaries, but he announced his withdrawal from the race early May 2016. He said the key to “thwarting radical Islam,” which he noted “poses a grave risk to the stability of nations and the well-being of their citizens,” is to defeat the Islamic State. “The demise of ISIS would also allow us to increase our attention on other agents of radical Islam like al-Qaeda, the Muslim Brotherhood, and certain elements within Iran,” Tillerson said. 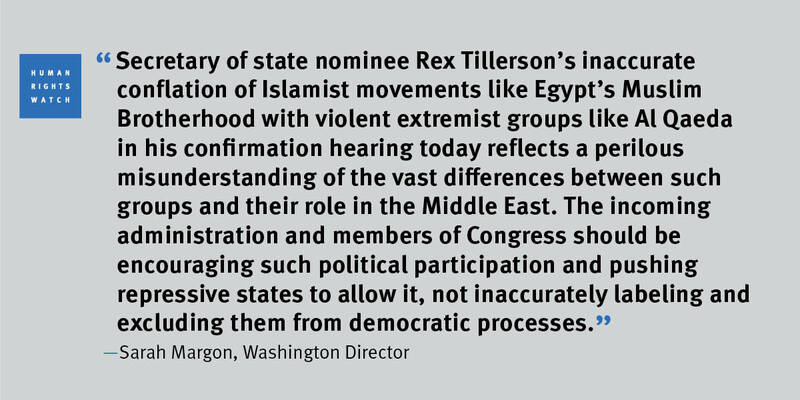 On Twitter, Sarah Leah Whitson criticized Rex Tillerson’s conflation of ‘Muslim Brotherhood’ with violent extremists like Al-Qaeda and said that it is “ignorant of facts, harmful”. The Muslim Brotherhood emphasizes that the reports recently published by some websites and newspapers about the “Brotherhood’s announcement of militarizing its anti-military coup mobilization and the group’s explicit adoption of violence” are not true and contrary to the track record of the movement as well as its principles. The professional media outlets are reminded that the positions of the movement are disseminated through its official outlets – the group’s official website, official Facebook account, as well as the official Facebook account of the group’s media spokesman – not from sites and pages run by individuals. The Muslim Brotherhood’s General Office and all its affiliate institutions emphasize the group’s position, declared in February 2014, and confirmed by the group’s elected Shura Council in mid-December 2016: the Muslim Brotherhood is committed to adopting a revolutionary path in resisting the coup. This does not mean “the militarization of the revolution” or the use of violence, but it means opposing the coup regime through every means of legitimate nonviolent resistance, compatible with all relevant international standards, to remove military dictatorships, and restore freedom and dignity to the people. This is a path that cannot be given up by free peoples, to protect their gains and at the same time to face the real terrorism that lives on the practices of repressive regimes. The Muslim Brotherhood is acting according to its new vision, the features of which were announced by the group’s elected General Office in its first statement, to build a revolutionary action that is capable of achieving a real change. The new vision also includes drawing a new map of political alliances based on common ground with the revolutionary and youth political forces, and other actors of the community, as well as the liberation movements and blocs that defend freedoms and human rights all over the world.